Ahh, those days w/ servants! The Roommate & I have a very old cookbook (early 1900s) and it mentions which part of the recipes you should have your maid do. 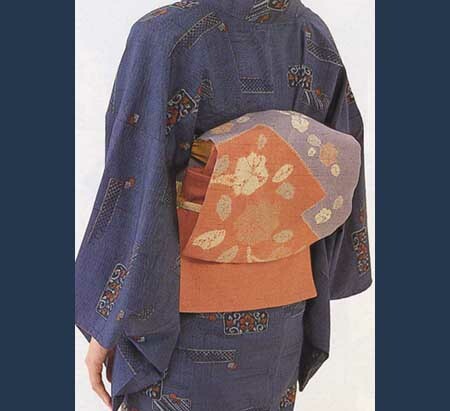 Along those lines, obi (帯), the traditional oversized belts worn by Japanese women w/ their kimono are difficult to put on by yourself; you need at least another set of hands, and strength. Thought you'd like to see two interesting gifts that the Roommate & I received from students when we lived in Japan. On the left is an origami Girls' Day display. Girls' Day, also known as Hinamatsuri (雛祭り), or Doll Festival, and in most homes there would be a large or small display of dolls (doll size influences display size). At the top are the Empress & Emperor, then below, various courtiers, including guards & musicians. A student had made this as part of a class assignment for public school, then brought it in to show the Roommate. He asked what she was planning to do w/ it: "Throw it away." NOOOOO! So of course he brought it home to me & it's been treasured ever since & on display in the 9 places we've lived since then. It's in my sewing room now. On the right is a cloth representation of Murasaki Shikibu (紫 式 部), a pen name for one of the earliest novelists anywhere. She wrote The Tale of Genji in the 11th century. When we left Japan, one of my students gave it to me. Her mother had made it. I thought it was nice, but my co-workers informed me that the student's mom is probably an expert & most likely a teacher of this craft--they could see the artistry and skill in it, even if I couldn't. I do love it though, and it's been another treasure that has decorated our various living quarters throughout the world. You may remember that my yukata was made from fabric representing Japanese women poets lounging. Here's the post showing that fabric. I have tried to decipher the very stylized writing to figure out which poet is which--but I haven't figured out which one is Murasaki yet. 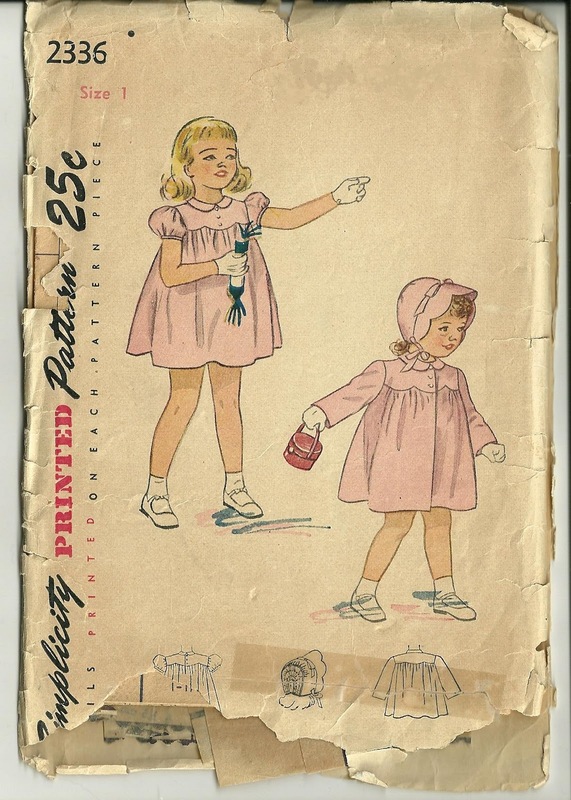 Vintage girl's pattern - blue coat - lining! I got a request for the lining, so thought I'd get this up. My mom got all the fabric, lining & buttons on the army base when she lived in Germany. Here's the post where I talk about the coat & you'll see some old photos there. And here's the post where you can see the pattern that my mom used. Or is there one?! This is so true it hurts! If you're wondering, yes I am sewing (mostly unsewing) and trying to decide whether or not to re-cut the bodice (I always buy an extra 1/2 yard for mistakes & mind changes!). Fortunately for me winter hasn't arrived...yet! You've seen the photo of me in my little blue coat (and seen the coat by itself--it's one of the many items of children's clothing in our bedroom). Well, here's the pattern. 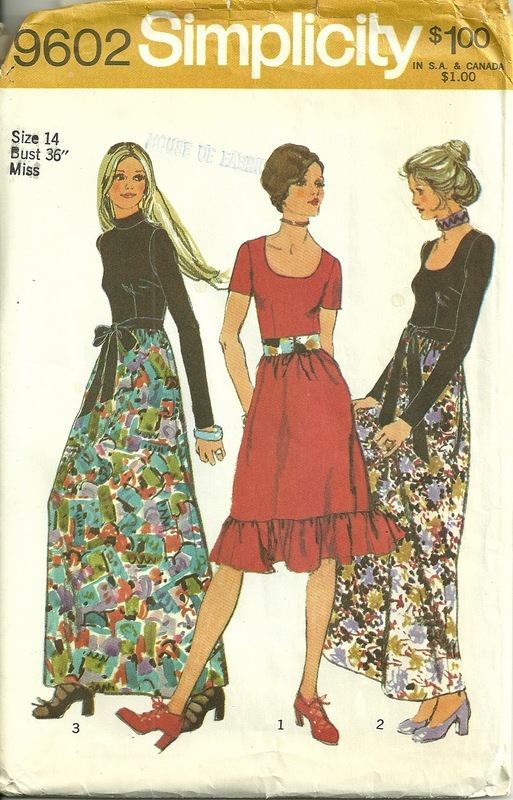 Looking thru the vintage patterns I have from my mom, I came across this & thought you might enjoy seeing it. 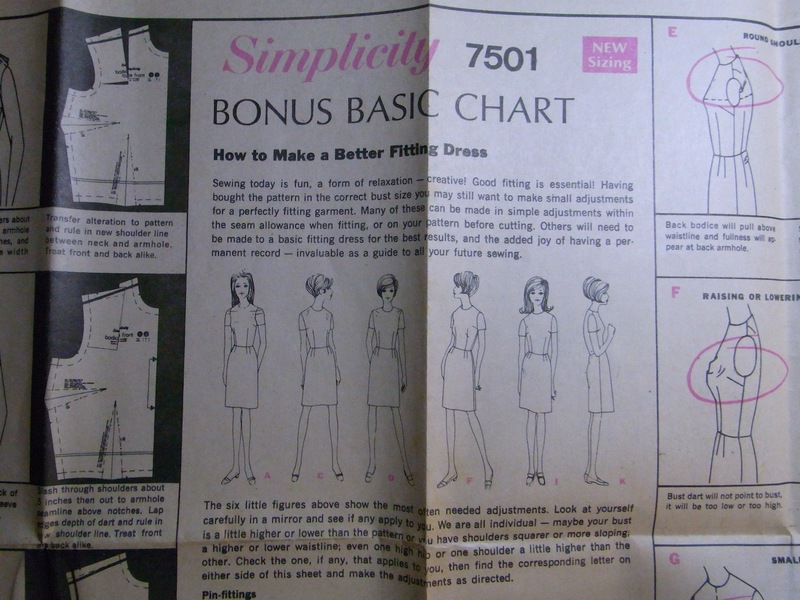 It's Simplicity 2336 & is from the early 1960s. Hopefully my mom will comment to let us know where she got it (Germany or the US?). If it was Germany I'm sure it was on the army base; apparently it was easy to get items from the US on army bases (maybe it still is?). I woke up this morning with this song in my head: Blue Sky, Allman Brothers, Dickie Betts singing. Actually, I'm pretty happy, so I almost always have happy music in my head. But that inspired me to try one more time...well, 4 more hours. I just keep finding that if I made the darts big enough, it really messed up the bottom & sides. 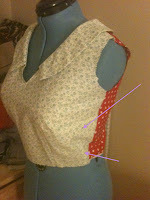 And taking up in the middle (adding a 1/2" seam down the middle of the front on the muslin), just didn't seem to do it. I also found (and am finding with the pattern I'm now adapting, too) that what fits on Helen, when cut out & sewed doesn't fit...sometimes not even close! 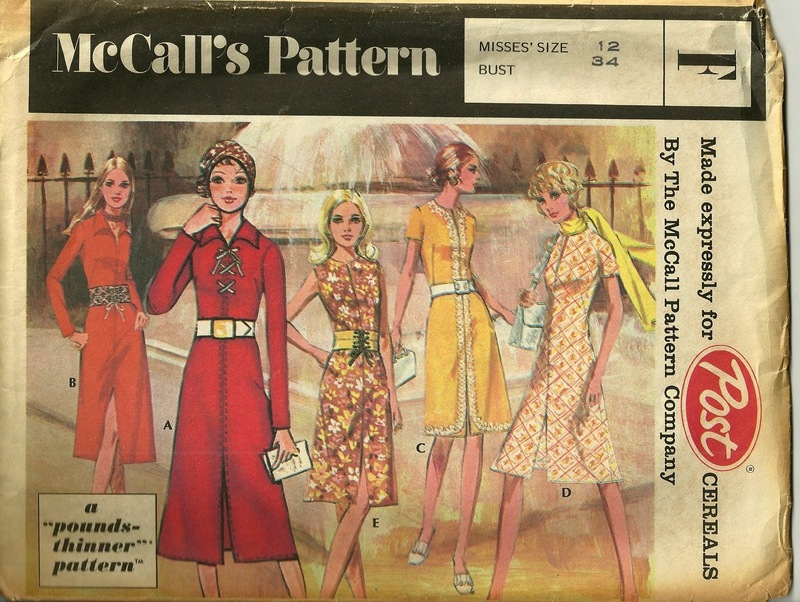 I never thought pattern making was easy; a friend in NYC does this for a living, and she's very much in demand, but I was right--it's difficult. 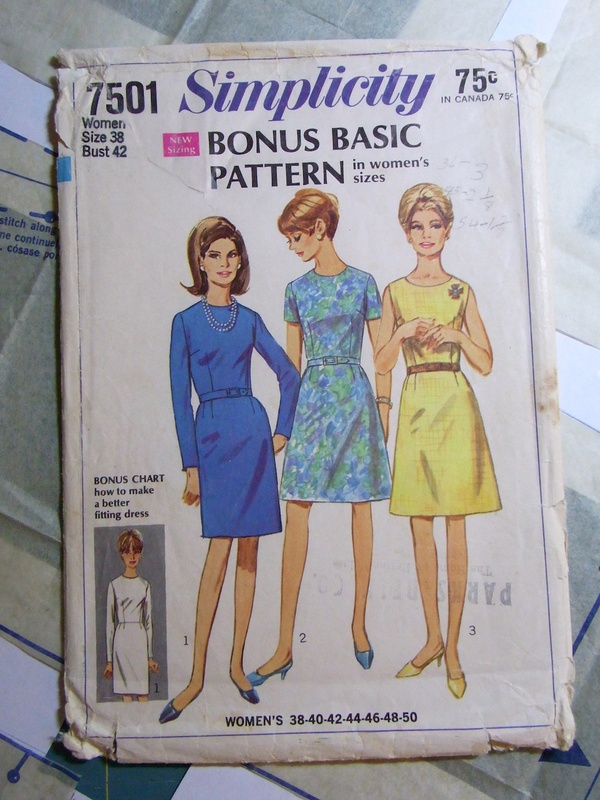 So I gave up & went thru my vintage patterns & found this one, Simplicity 9602, from my mom. It's the right size--a 12 in the old size; 1971. 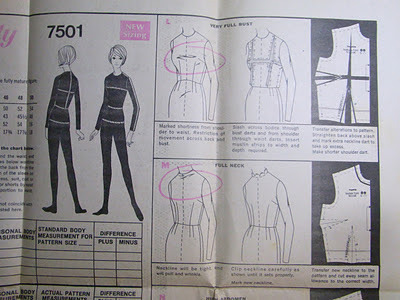 I still have to modify it a bit because I want a V-neck & a collar (still trying to get Scruffy Badger's Simplicity 7501!). But since I'm starting with the correct size, not 6" too big, I'm hoping this will go better & faster. 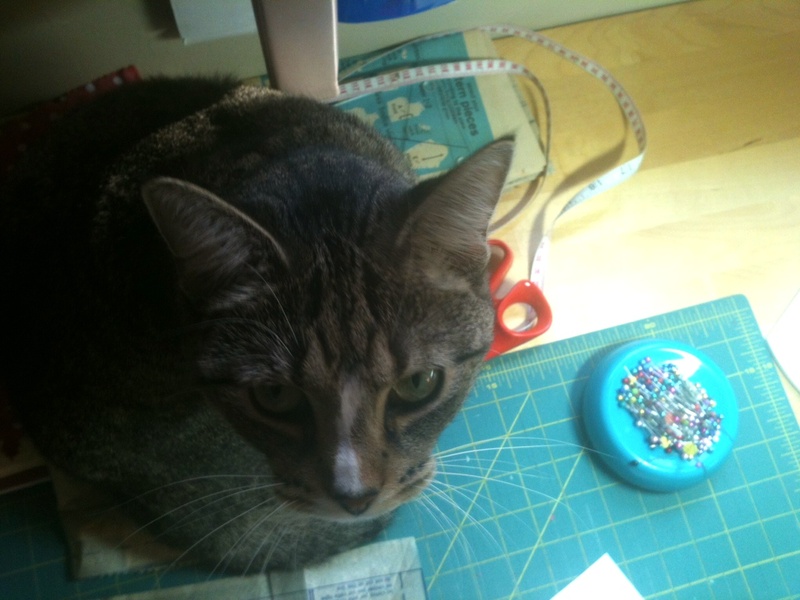 I am finding that sewing with corduroy is a bit of a challenge. 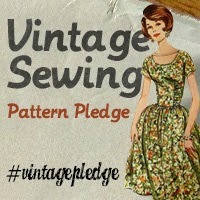 I have to pin more & sew slower or everything crawls around. 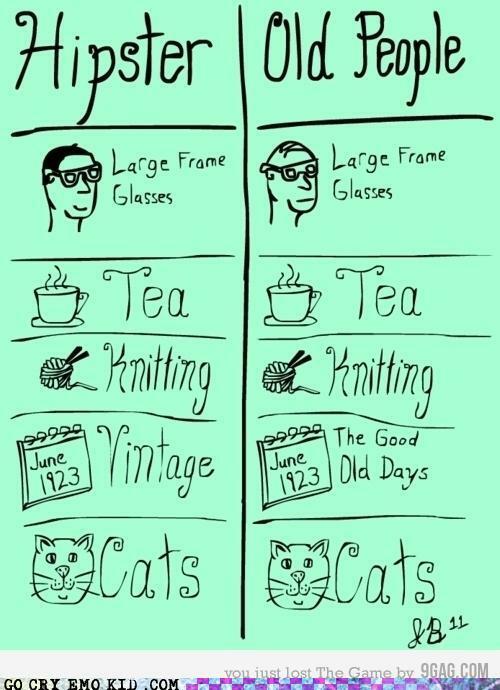 And I'm used to pressing cotton, or linen, which is so hardy. I'm using a very light hand so I don't mash the corduroy. Here's the fabric in case you've forgotten thru all this what it looks like. I was in Hancock again today (forgot a zipper, so I bought 3), and they still had the pincord (thin corduroy) on sale, so I got more...purple this time! Another print, of course! 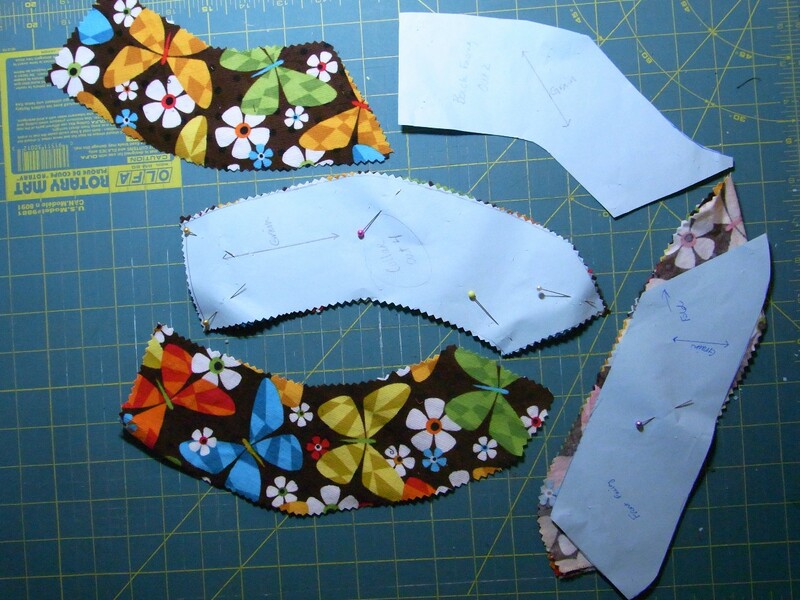 I've missed this class (ends 11/30): Bits of Thread Pattern Making class - Bodice, but this experience has definitely made me interested in taking the same thing, hopefully in the spring. Reader, I gave up...or not! I thought I had it on this version, then I had a horrible time getting the back to fit. You can see on the left what the piece I was using looked like when I started (and that was after many adjustments), and on the right is what actually works & fits! After what felt like a zillion more adjustments. You can see that Bella is very supportive. She likes supervising me when I'm working. She especially likes the warm light & the warm computer & playing with thread. She gives lots of head bumps so that keeps me going. I am going to give it another try. Or maybe not. I will see how I feel in the morning after yoga class & a trip to Heidelberg Bakery! I took a look through some other vintage patterns I got from my mom. 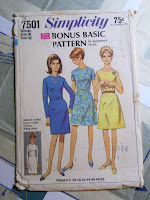 I found 2 that might work, not exactly what I want, but that will work with the fabric I bought. And I'm rather under the gun on this. I know once I really start it won't take that long, but I've only got thru this Monday, really. I just don't have that much time and we'll be away for Thanksgiving and Xmas & then again to California in January...so if I don't get it done soon, it won't be done before spring & won't be much use to me then. I'll be thinking about spring colors by then! 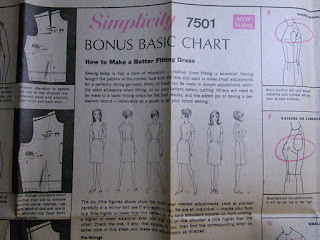 In the meantime, you'll find me on Bonanza or Ebay looking for a Simplicity 7051 or something similarly cool in my size! I'm wondering if a belt would take care of that waist bulkiness? You may have seen the list of items I've made (I've made more, but don't necessarily have pics, or haven't put them up); this in particular, a tablecloth & 2 small quilts I made of fabric we bought in Ghana & Burkina Faso. Well, it's winter here now (cold & rainy tonight), and Bella is staying warm by avoiding the hard wood floors and the leather love seat! And here are some nice warm wool socks from back in the late 1980s when I was knitting socks a lot. They're the Roommate's. They haven't been worn that much (wool doesn't look good at all when you live in the Middle East! 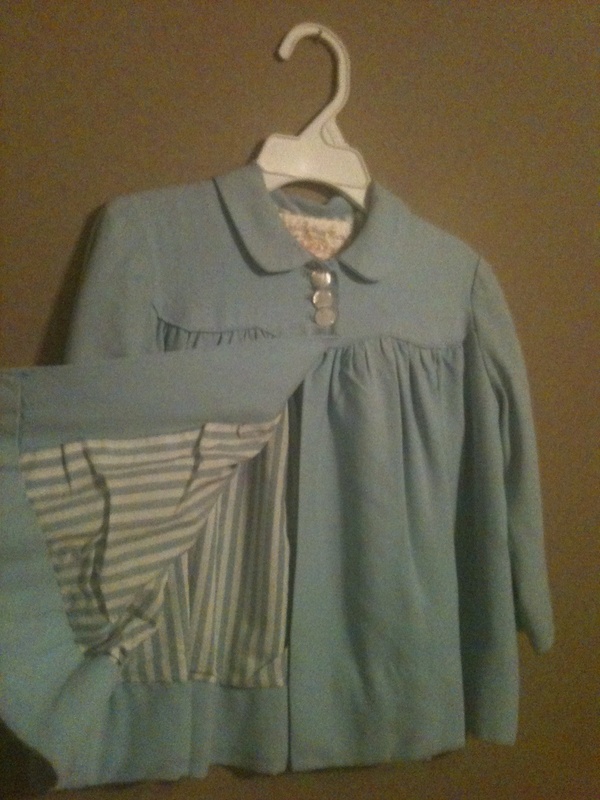 ), so they're 20+ yrs old but in great shape...I can never make the same thing twice, hence the mis-match. Do you love the bedspread pictured above? It's a print from India. 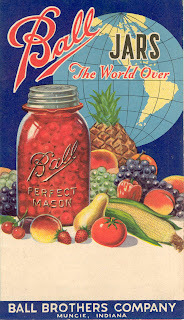 Post was a big food company, they made breakfast cereal before being bought out by an even bigger food company. I wonder if my mom saved cereal box coupons to get this, or did it come in the cereal box? But it's the correct size, so perhaps she sent away for it. I don't remember if she made a dress from this pattern? (I'll ask.) Or was it for me or my sister? 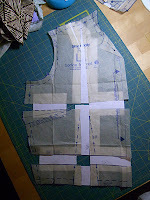 The pattern has been cut. As I mentioned before, we didn't take enough photos of weavers working when we were in South America & Central America. However, here's a nice one of a woman in Guatemala using a backstrap loom. And check out her huipile, the top she has on. She's probably weaving another; I'm sure I asked, but do not remember. The second photo is a huipile shop in Antigua, Guatemala. We saw an awful lot of beautiful, high-quality huipiles for sale in the big market towns (Antigua, Chichicastenango, etc. ), and it rather boggled my mind; I mean there are only about 14 million people there; it felt like each of them was trying to sell 3-4 huipiles! Finally, the women in the third photo are a the market in Nebaj, and are wearing typical northern Guatemala dress. (It's pretty easy to tell where women--and sometimes men--are from, if they're wearing their traditional dress.) Can you see the woman on the right?! In her hair is braided this amazing ribbon, which is woven & embroidered. We have such a "ribbon" but it's only 6' long--we saw some that were 12'. This is the problem w/ traveling while poor--I could have easily bought 10 of them, but instead had to make a choice! We did buy 7 huipiles, though! Finally...I think this may be it. See what you think. I don't know how many time I've re-done the darts, but it sure looks like it's just about right now. Some way or another when I was taking up the pattern, I ended up w/ too much at the shoulder seam, and not quite enough at the side seam. But that's easily fixed. I've cut out the back now & marked the darts. But when I sewed up the first little waist dart, I didn't do it right; that's usually how I know I need a break, or am too tired to continue. Generally I find if I just keep going I end up making all sorts of mistakes & the next time I sit down to work the first 30 minutes or so are un-sewing. So I took the hint from that messed-up dart & went downstairs to deal w/ the laundry & to finish up a fruit salad the Roommate had started. Update...well, maybe not quite. The back wasn't quick either. I had even taken out a bit from the center of the pattern (with a fold, like I did on both sides of the front), but that wasn't nearly enough, obviously. And the darts don't sit right at all; almost as if I've got a bust at the back, too! They are also not quite at the waist. Onward! But I'm going away for the weekend so it will have to wait 'til the holiday weekend (11/11) for more work. This looks to be a never-ending project! Hope you're either a) learning something or b) amused by all this. I took out the darts & tried again--essentially I moved them out about 1/2". Pinned, put on Helen. Looked okay. Sewed them up, put on Helen--did NOT look okay. If you're wondering what that white triangle is in the photo, it's a dart that I just keep moving around to trace onto the pattern. I figure it's a normal size person bust-dart, so once I get the angle correct it will be the right size & shape. It probably doesn't show in the photo too well, but I just pinned the neck & the side seams to the dressmaker's friend and marked the fullest part of the bust. Then I laid my paper dart and pointed that right at the fullest part. Then I drew on the darts. I will sew them up later; I have to go pick up the car which is getting new tires for the (supposedly bitter) winter that's got started last weekend. I think I've adjusted & re-adjusted about 8 times now! I do feel I'm getting close. I finally put in the waist darts, trying to make them a bit wider so they made the waist fit better. 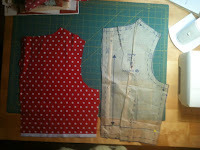 Then I went back to the upper darts, trying to get them the right width at the side seams & at the right angle. I'm really hoping this pays off in me being able to use it over & over...if not, I'll be pretty upset to put in all this work! Or maybe it's character building?! I didn't need to gain respect for pattern designers, but boy, is this difficult. I'll have to pay more attention at they gym when I watch snippets of Fashion Project Runway. I have to go to work tomorrow, & we're going to NYC this weekend, so I was hoping to get it done today...not sure whether I'll get back to it before next week. But at least I feel like I might actually figure it out at this point.